Protocontrol Radar level tranmitter uses 26G high frequency radar sensor for its operation. 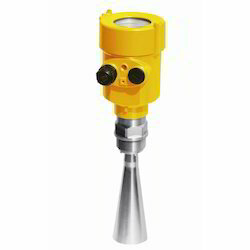 The maximum measurement range can reach up to 70 meters. Antenna is optimized. Further processing is done by new generation microprocessors which have higher speed and efficiency. This transmitter can be used for level measurement of reactor, solid silo and very complex measurement environment. Almost no effect of corrosion, bubble, water vapors. It is also not effected due to change in the temperature and pressure of the medium. No effect of dust. Works well in highly dusty environment. Due to short wavelength, the reflection of solid surface inclination is better. As beam angle is small, the energy is concentrated, can enhance the ability of echo and to avoid interference. High signal-to-noise ratio, the level measurement in fluctuating state can obtain better performance. PRINCIPLE OF OPERATIONRadar Level Transmitters operates on Time Domain Reflectometry principle. A wave is emitted by the antenna. As soon as the pulses reach the surface of the medium, it is reflected back to the electronic module. Level / distance is directly proportional to the flight time of the pulse. The measured Level data is converted into 4-20 mA DC analog, isolated output (4 wire models). Optionally information about level measurement is sent via RS232 or RS 485, HART Protocol to a PC for processing and diagnostics, or data logging.